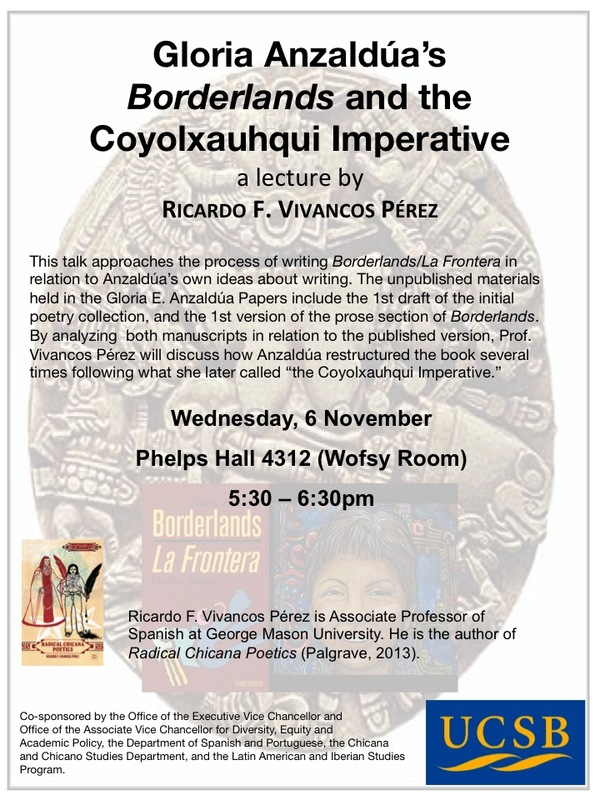 It is our distinct pleasure to invite you to the"Anzaldúa's Borderlands and the Coyolxauhqui Imperative" lecture by Ricardo Vivancos on Wednesday November 6, 2013 at 5:30pm. Ricardo F. Vivancos is Associate Professor of Spanish at George Mason University. He is the author of Radical Chicana Poetics (Palgrave, 2013). This lecture is co-sponsored by the Office of the Executive Vice Chancellor and Office of the Associate Vice Chancellor for Diversity, Equity and Academic Policy; the Department of Spanish and Portuguese; the Chicana and Chicano Studies Department; and the Latin American and Iberian Studies.